Coral bleaching, in Kaneohe Bay near Kaneohe, Hawaii. 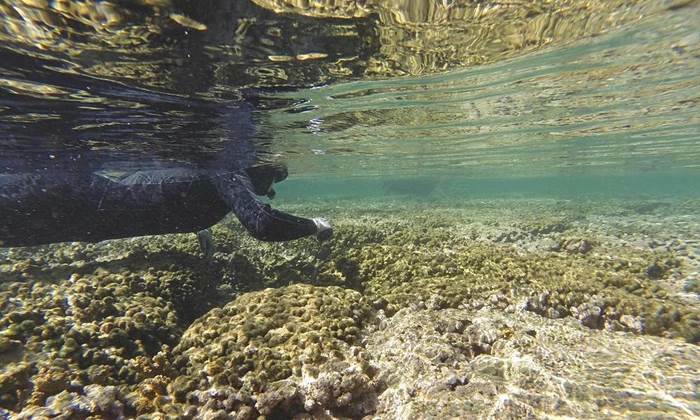 Photograph: Dan Dennison/AP (source http://www.theguardian.com/us-news/2015/sep/13/hawaii-coral-bleaching-scientists-predict-worst-ever). Hawaii is experiencing some abnormally warm ocean temperatures causing extensive coral bleaching which is most likely the worst bleaching event recorded. When corals bleach they expel there symbiotic algae which they rely on for nutrient and loose there colour. If temperatures don’t drop down to normal levels after several weeks this leads to coral death due to thermal stress and nutritional depletion. Researchers from the Hawaii institute of Marine Biology indicated that most corals recovered from a milder bleaching event last year but this year’s event where water temperature is has been elevated for extended periods by as much as 3 degrees above the normal summer range has resulted in severe bleaching and significant coral death.